I had a wonderful request to write a post about grooming tips for b/d dogs and what has worked for me. It was good for me to stop and think about a grooming session with Treasure step by step. She’s been with me long enough now that our grooming sessions are comfortable and routine and I don’t think either one of us really has to think too much about them. What I do to make her sessions low-stress and happy has become an automatic habit for me, so I had to take some time to think about each aspect and things that I do (or did) differently with her in the beginning. Even though I use both of my hands when grooming, I have to be mindful that Treasure needs my touch for feedback throughout the process. She cannot see what is coming next – the grooming tool I’m holding or where my hand is going to touch her next. She cannot hear my voice softly praising or giving her cues to wait. I have developed ways of grooming which flow and allow me to keep one hand in contact with Treasure almost constantly. This way she knows where I am in relation to her and she knows where she will be touched again with the grooming tool. She also knows that we’re not finished yet. There are times when I need both of my hands and if I stop that contact, she thinks we may be done and starts to get up. As soon as I touch her again, she settles back down, knowing we are not done. But I try to keep those interruptions to a minimum by maintaining a light contact with her throughout. In the beginning, I went slowly. There is no rule that says you must groom the entire dog in one session! Just a few minutes (or even a few seconds in some cases) over time can teach your dog to be accepting of grooming. Try to end while things are going well and your dog is accepting. It is so easy to want to keep going when things are going well, but then it becomes too late once your dog has had enough and is no longer happy about things. Once things start to go south, it is even harder to convince your dog the next time to cooperate with you. Your dog learns that grooming time is a struggle. Stop while things are going well. Sometimes you might have a thought of, “wow, this is going really well.” If you have that thought, it is time to end the session on that good note. Later, you can build up the amount of time you are expecting your dog to accept the grooming. For now, nice short and sweet sessions, interspersed with lots of calm and soft stroking and scratching in favorite areas, will go a long way toward your future success. If you approach grooming time thinking in your mind that it will be a struggle, your dog will pick up on that and will most likely react in that manner also. Instead, create a picture in your mind of what your ideal grooming session would look like. How would your dog behave? What order would you do the grooming tasks in? Would your dog be on a grooming table or on the floor with you? Would your dog be enjoying the session? Would you be enjoying the session? Try to keep that image in your mind while you get ready and get your dog for the session. Keeping a happy picture in your mind will help you to be more relaxed. When you are relaxed, your breathing deepens and gets easier and your muscles relax. These are all cues to your dog that you are relaxed and happy about the whole thing. Dogs follow our lead in most situations. If you are tense your muscles will be tight and your breathing will be shallow, and your dog will also be tense. Where and how will your dog be most comfortable? Treasure and I are most comfortable with her lying with me on the floor during grooming, with her lying on her side. I can groom her with her standing up, but we are both more relaxed with her lying on the floor near me. Set up the situation for success by making sure both you and your dog will be comfortable. When a body is not comfortable, it will be tense, and that tension will affect our enjoyment and tolerance for whatever is happening around us at the time. I always let Treasure smell each grooming tool before I use it. I touch her lightly with it and let her turn to smell it. Sometimes this is just a split second sniff. She may not even be interested, but I give her the chance to “see” it anyway. Each tool is used in a different way and feels differently on her body. With repetition, she has learned what each tool smells like and what to expect me to do with it next. This helps her to remain relaxed because there are fewer surprises for her during the grooming session. I don’t put any additional scents on the grooming tools. She can tell the difference in them just as they are. My dogs that can see will glance over when I change grooming tools to see what I’m grabbing next. They have learned the same way, by repetition, what each tool is used for. I also use verbal cues with them about what each tool is – toenails, brush, comb, teeth, eye drops, etc. Oh, and Treasure won’t let me forget this next tip! I have special treats that are ONLY for grooming time and they are kept in our grooming box. It is the only time my dogs get these particular treats, so they have become extremely special! When they are finished with the session, they are allowed to have these very special treats! During the teaching phase, I may use these special treats more often throughout the session, but at this point, all of my dogs get their treat at the end, to end their session happily! While there will always be parts of grooming that our dogs don’t like as much as others, these tips are things that I do to help keep grooming time as happy and low-stress for my dogs as possible. I hope I’ve given you some new ideas to try with your own dog. Excellent advice! I especially like that we don't have to groom the whole dog at the same time which is how we did nail grinding training. I started having my deafie on the bed and letting him see and smell the dremel which was enough for one day. The next day I let him smell it while it was on and touched the non spinning part to his foot- enough for the second time, etc, etc,. And I only use one special treat for grooming. Really great information,This blog Is very informative , I am really pleased to post my comment on this blog .Thanks for sharing. Great tips and advice! I truly appreciate it. Thanks for sharing! My dog is starting to go blind and so when its time for us to brush him he often gets frightened and hides from us. I liked how you suggested letting the dog sniff the grooming tools before you use them. Yet the most extensive grooming I've done is to brush him. Do you have any tips for a beginner on how to get started doing other grooming things? Or would it be easier take my dog to a groomer? 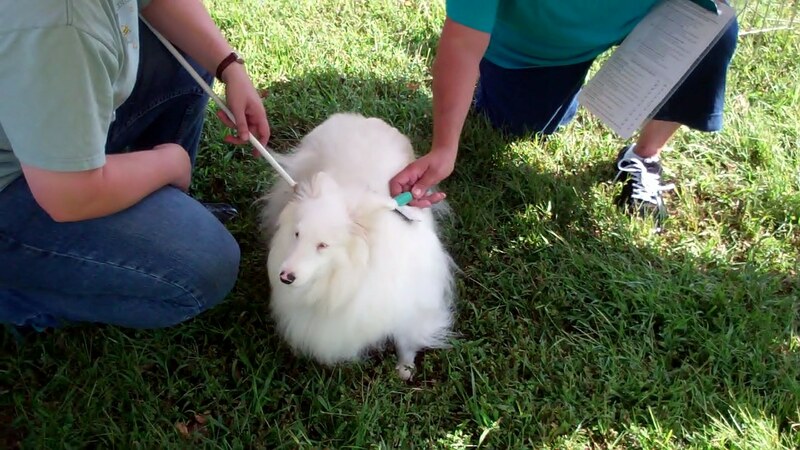 Depending on what you are wanting to do, it may be worth paying a groomer who will show you how to do some more basic things and help you get started. A groomer can show you how to get started clipping nails for example. Take it slow with whatever type of grooming activity you choose to introduce and make it a fun experience for your dog. Take lots of breaks and give lots of pleasant touching/petting and treats to keep it fun! Excellent advice! My dog is newly blind and needs his hair shaved and a bath. I'm so glad I found your tips, I can see them helping. Thank you!